A partial method is a method declared in one portion of a partial class and implemented in another. You can also declare a partial method in one place, but not provide an implementation. What happens, however, if the class that includes the partial method declaration includes a call to the partial method, but then you never provide the implementation? 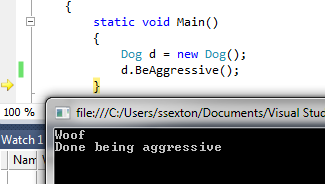 For example, assume that we declare Dog.Growl as a partial method in the following file, but then never provide an implemenation of Growl. If you compile this and your code does not include an implementation for the Growl method, the compiler does not complain. It just quietly removes the call to the Growl method.